Route 80 was converted to bus operation in May 1960. From 1946 until its conversion to bus operation in March 1961, Route 61's southern (Center City) terminus was Walnut St. between 8th and 9th Sts. - 3 blocks west of Independence Hall. From Route 61's conversion to trackless trolley in October 1941, until 1946, its southern terminus was one block further south, at Locust St. between 8th and 9th Sts. Note also that from August 1959 until March 1961, Route 61 trackless trolleys operated weekdays-only, with bus operation substituted on weekends and holidays. Route 75 (as did its streetcar predecessor prior to April 1948) operated east of Frankford Ave. to Richmond St., via Margaret/Lefevre and Orthodox Sts., until it was cut back to its present eastern terminus at Frankford & Arrott in April 1966. Route 79 was unusual in that it was converted from streetcar to bus operation in October 1956, and then from bus to trackless trolley operation in June 1961. 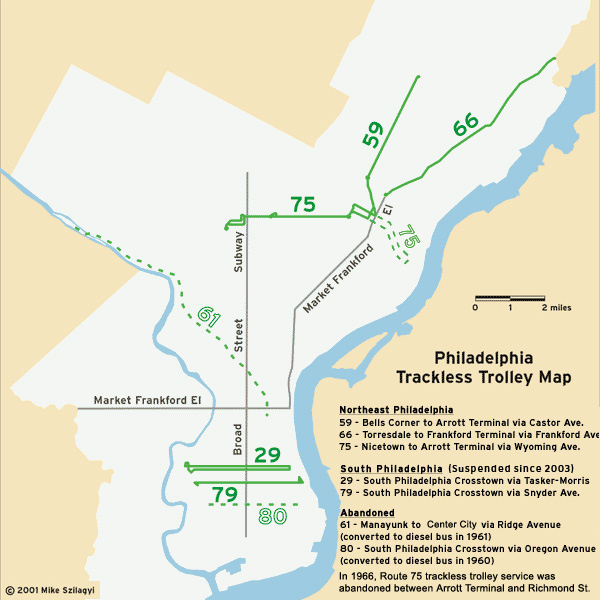 It utilized post-war 200-series Brill trackless trolleys that had been released from Route 61 upon its conversion to bus operation in March 1961. The remaining pre-war 100-series Brill trackless trolleys were retired coincident with the Route 61 conversion to bus operation. Return to the trackless trolley history article.